For once there is an eerie the way stories have been stirred up in the name of fiction. Cold blooded scenes have partly overtaken the conventional murder scheme of things and replicated the same success of their elder sibling. 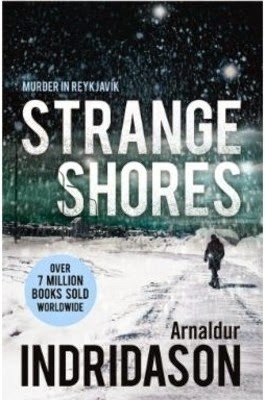 Author Arnaldur Indridason in his Erlendur detective series book "Strange Shores" takes things forward and keeps the detective in the loop. So has he been able to weave the exact same magic like the other books? Let's find out. A young woman walks into the frozen fjords of Iceland, never to be seen again. But Matthildur leaves in her wake rumors of lies, betrayal and revenge.Decades later, somewhere in the same wilderness, Detective Erlendur is on the hunt. He is looking for Matthildur but also for a long-lost brother, whose disappearance in a snow-storm when they were children has colored his entire life. He is looking for answers.Slowly, the past begins to surrender its secrets. But as Erlendur uncovers a story about the limits of human endurance, he realizes that many people would prefer their crimes to stay buried. First look at the title and the cover and one can fall for the strange alienated concept. The lone man, the falling snow is a perfect set up to lure the readers in to reading the book. The title carries the eerie of what's bound to occur and gives a few goosebumps. The blurb has been kept ultra short and talks about people going missing in a small town of Iceland. It's pretty much a statement as to what one wants to find out in the book and how the author has led up to all this. The story is set off in Iceland, where in a small town long back in 1942 a grave storm swept away a lady and a small child. But the lady Matthildur becomes a mystery as the after talk never dies down. Detective Erlendur lands up in the town and goes out of the way to uncover the truth behind the missing lady. So will he really be able to hit pay dirt or is it all a rumor? What is there to be seen yet it cannot catch the eye of the detective? What will be the end result in the end, the emotions stirred up or a lost cause? That's what the story is all about. It's a story beyond imagination. Once it shakes off the initial sluggishness it takes turns to deliver drama, suspense and off all the things curious characters in the book. There are some baffling aspects which keeps the story in tune with the entire prospect. The ease with which the book delivers the complex of the things is what makes it a compulsive page turner. The book takes pride in delivering action in the most soft manner yet it hits hard and lets you swallow done the impact of it. The long list of characters manage a viable presence in the book and from the lowliest of the peasants to the the most obscure of the residents of the town they all leave a grave impact and give some handful to the story. The only downside of the book is it's parallel slow ever evolving past which couldn't quite sync in and leave a spellbinding effect of any sorts. It thus manages to stall the progress and throw the readers off trail and becomes quite an eye sore in the story. All in all the book promises to be an exciting prospect. It banks on simplicity with complexity and hitherto hits the sweet spot. It is sluggish but the pace grants the author to imagine and leave a desirous and delirious impact on the mind of the readers. There is a hint of emotion too which plays with the mind and the soul yet pries open a different side to the story. It's a picture perfect story.